Our backyard ice skating rink site gives you the COLD and HARD facts on building a backyard ice rink. We think it is really important to check your slope. If you are feeling confident in your site having a gentle slope continue……. Assembly is As Easy As 1,2,3,4. 1. Place and organize your frame/box on the flattest, least amount of slope area in your backyard rink site with 2” x 8” s as a minimum board height. 2. Use the amazing 5 in 1 Rink Stake to fasten your backyard rink frame all together. 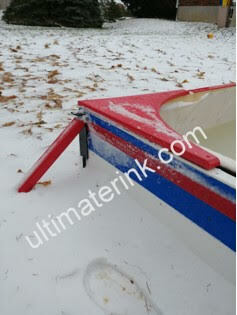 All seams will be fastened together with a 5 in 1 Rink Stake and with 4-6 screws. 3. Lay in your poly liner tarp leaving at least 2 feet on all sides as a flap. Hold the liner in place with liner clips and turn on the hose. Don’t walk on your liner ever. 4. 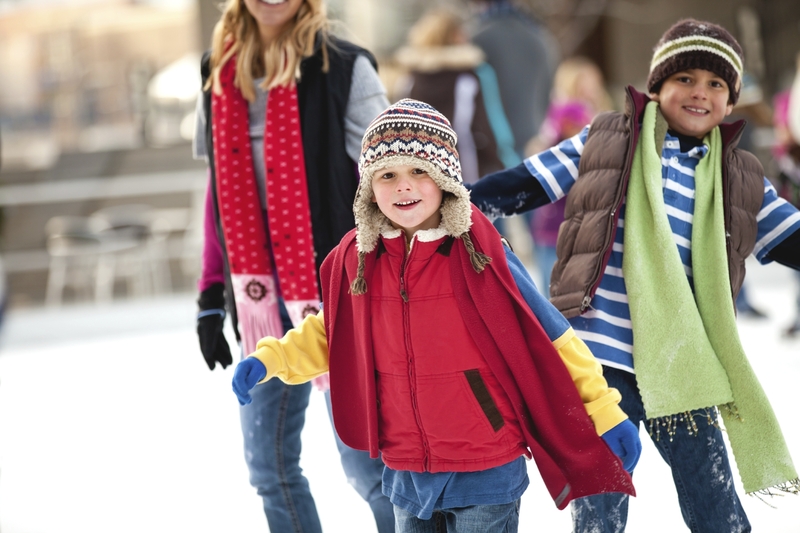 If your site is level or with a gentle slope then you are ready to secure your liner on the outside but towards the bottom of your frame and skate when frozen. If the water is approaching the top of your backyard rink frame then turn off the water and move to the next 2 “easy fix” steps below. Moderate Slope of 5”- 9″ and no extra purchases. 1. Add a second tier in the end or the side where your water is highest. 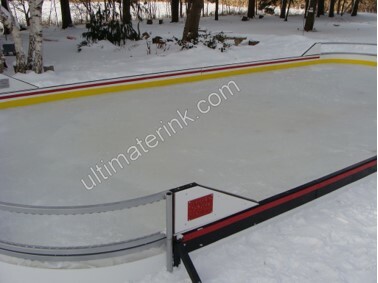 This is one of the easiest solutions to handle with our backyard rink assembly system. 2. Now take out the 4 screws in each 5 in 1 Rink Stake and pull your amazing 5 in 1 Rink Stake 3″- 4″ higher out of the ground until the top screw holes on the 5 in 1 Rink Stake face matches up to face of the new second tier of wood framing material. (do this one 5 in 1 Rink Stake at a time and refasten) Re attach your 4 screws and you have now bound the top and bottom tiers together. No extra materials needed. 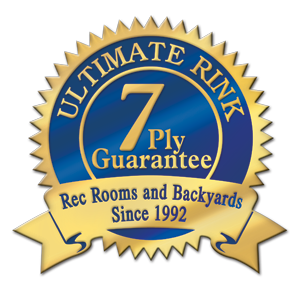 Elapsed time: 5-8 minutes for about 10 5 in 1 Rink Stakes and no need to order any thing extra. Now place your liner flap over your new second tier and again temporarily re secure with liner clips. Start you water flow again. When the water is completed flowing and you have at least 2-3” of water in shallowest area, secure the liner over the top on the outside of the frame towards the bottom of your rink framing. If you have a slope of more than 9″ see our Sloped Backyard, 2 Step, Easy To Manage You Tube Video.